Sports as we know them are undergoing change. While in the past the physical requirements from athletes in different sports were similar; over the years, the requirements have changed and specialties have formed, such as tall basketball players, swimmers with wide hands etc. As time goes by, it seems that our ability to further enhance performance reduces, and in order to continue improving we will have to take advantage of the capabilities of other animals. In the past years, the field of biomimicry has developed in science. This field strives to understand the creative solutions developed by animals and plants over millions of years of evolution and apply them to our everyday lives. A famous example for this is Velcro, which is based upon the distribution mechanism of thistles. Another example is the shape of the fast train in Japan, which is based on the structure of the beak of the kingfisher. These types of tricks are also used in different sports, and contribute to the improvement of athlete performance . 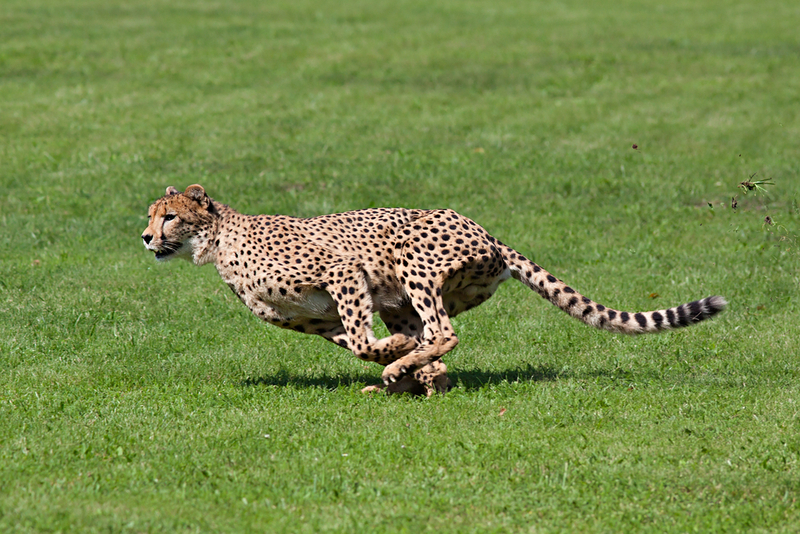 One of the qualities that makes the cheetah the fastest terrestrial animal is the motion of its feet. 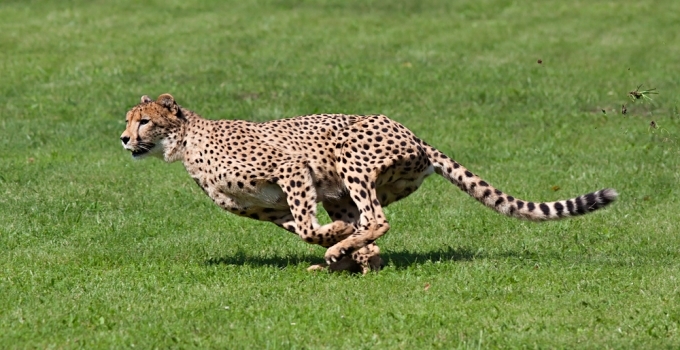 The cheetah runs with its claws drawn out, sticking them in the ground, thus providing it with a better grip on the ground, which enables it to surge forward. The same principle has existed for years in soccer cleats. However, in 2008 a leading shoe company took it a step further, and developed shoes with small blades, which gives the runner a better grip on the ground. The shoes stood to the test in the 2008 Beijing Olympic Games when the Jamaican sprinter Asafa Powell won the 100 meter run on a wet track while wearing them. Another example from the running field was born in parasports, and is developing as a field in itself: the use of kangaroo feet (or, Kangaroo shoes). In short, these are shoes that enable us to jump in the same way as the kangaroo does. In nature, the kangaroo’s feet act like a spring – a device that can accumulate a lot of energy, and use it to jump and move forward. When the kangaroo lands, the gravitation energy accumulates in the spring-like structure that its legs create as they bend, and then it can jump again with a smaller investment of energy. The artificial kangaroo feet work in the same manner, but by mechanical means. The debate regarding the use of kangaroo feet arose during the Beijing Olympic Games when the handicapped sprinter Oscar Pistorius asked to use them in a competition against non-handicapped sprinters. The request was discussed and eventually approved after they could not prove he had an unfair advantage over the others. Eventually, indeed, the artificial feet did not help, and Pistorius did not meet the Olympic criteria for that year. The same technology is used nowadays by non-handicapped athletes, allowing them to jump two meters high and to three meters far in every step of running, causing them even to burn three times as much fat. Many sports require the participants to protect their heads. One of these sports is bicycle riding, and in this case as well, an interesting solution was adopted, this time inspired by the toucan. The toucan is a bird that has a very long and thick beak, which is about a third of its entire body. Sound pretty heavy, doesn’t it? But no. The toucan’s beak is built like a sandwich: outside it is covered with an outer layer of keratin (as in our fingernails), organized in tiny scales that prevent it from cracking. In the middle, there is an air-filled structure with many holes that are held by scaffolds of calcium and keratin. This results in a very hard and also very flexible structure, which can also fold quite impressively. These days, in the University of San Diego, motorcycle helmets and maybe later on, airplane chassis, are being developed using the same principle. There are many other examples, such as developing shock absorbers based upon the mechanism by which the woodpecker protects its brain. Another example for an innovative helmet is one that is based on the structure of our human head, which is built at a skull covered with skin. A helmet such as this enables a high amount of flexibility and friction as the helmet hits the ground. This prevents the head from turning too much, and helps prevent severe head injuries during an accident. The soccer ball was designed in the 1950’s in an innovative manner from pentagons and hexagons, in order to save on materials– also in this case, humans did not invent anything new. This structure is called a geodesic ball, and it is the most efficient way to close a space, namely, to include the most volume in a minimal surface area, and thus use a minimum amount of material. The shell of a turtle is built on a similar principle, and consists hexagons and pentagons. A few years ago, a tennis racquet based upon three different biomimicry technologies was developed. These technologies are based upon the feet of the gecko, the skin of the shark, and the bees’ beehive. The handle of the racquet is based upon the technology of the gecko – the mechanism that enables geckos to hang vertically on walls by microscopic fibers, which create a vacuum between their feet and the wall. Their feet are hypothetically able to carry a weight of over a 100 kg. The manufacturers of the tennis racquet adopted the same technology in order to enable the players to hold on to the racquet tightly without it slipping. In addition, the structure of the racquet frame is based upon the Shark skin technology, which was created to mimic the structure of the shark skin. It enables minimal friction of the frame with the air, and reduces the effort invested in every strike. More on this technology will be explained later in the article. Finally, the racquet itself consists of carbon fibers built in hexagons, inspired by the beehive created by the bees. This structure is light and very stable, and contains mostly air, with carbon support bars – similar to the beak of the toucan. In the 2008 Beijing Olympic Games much attention was drawn to the bathing suit of the swimmer Michael Phelps – a long bathing suit with a strange texture. A closer look at the bathing suit revealed that it contains tiny structures that resemble partially overlapping scales, using the shark skin technology mentioned earlier. This enables the water to flow around the swimmer more smoothly, and reduces the whirlpools and currents of slower moving water. Thanks to this technology, Phelps managed to glide his way more easily to victory. A few years later, this technology has been banned from use for swimmers, since it was decided that it gives an unfair advantage to its users. Nowadays, it is used to coat ship bodies in order to reduce friction with the water, thus reducing fuel consumption and the amount of algae adhering to the side of the ship. One of the problems faced most by athletes, especially in sports that involve a lot of running, is sweating. The clothes become wet and adhere to the body, which leads to an unpleasant feeling. In the past few years, many efforts have been made to develop fabrics that allow better ventilation and better sweat evaporation. One of the interesting solutions is based upon the pinecone – the fruit of the pine tree. The structure of the pinecone is influenced by humidity. When it becomes wet, its scales close in order to protect the seeds; whereas when it burns or dries, they open up, and the seeds spread on the ground, waiting for the next rain. A new type of fabric was developed using this idea. Small moisture sensitive pores are incorporated into it, but with an opposite mechanism – when the clothes becomes wet, the pores open and allow air to pass and evaporate the sweat, and as long as they are dry, the pores are closed. In order to protect the athlete from rain, the outfit is covered on the outside by a water-repelling layer. Therefore, we see that engineering principles developed in the animal and botanical world are adopted to sports. Together with these efficient principles, which human engineers might have never been able to develop by themselves, we can reach higher achievements in sports. Special thanks to Michal Topaz at the Safari in Ramat Gan for help with the research.